Make coffee you love easily with the Open Box Miele CM6350! 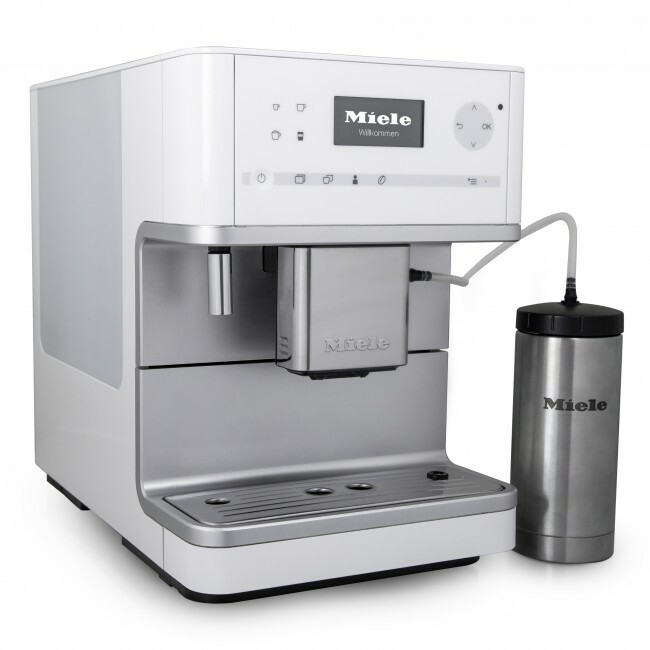 This Miele brings top quality espresso shots, one-touch milk drinks, and custom profile programming all to the table through open-box pricing. Being one of the few coffee makers that also offers users the ability to brew a full pot of coffee, or up to 40 ounces of coffee to be brewed at once–this open box gem is the perfect machine for both home and office settings. 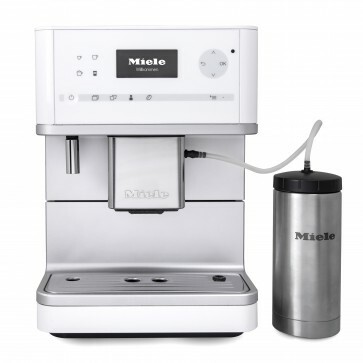 Other features include auto-on and auto-off timer modes, an active-heat cup warmer, a hot water spout for Americanos and tea, barista cup lights, and an insulated milk carafe with automatic rinse profiles for hands-free cleaning. Don't miss out on this short window of opportunity to bring home an open box Miele 6350! Drink Programming - Set shot pre-infusion, temperature, dose, and length for each drink recipe. 4 Profiles - 4 drink buttons and 4 custom profiles means 16 one-touch drink options at your fingertips. Milk System - The open box CM6350 includes a double-wall steel 20-oz. milk carafe that keeps milk cool for hours and siphons directly into your machine's steam assembly. Easy Cleaning - This Open-Box Miele packs in custom cleaning profiles, including automatic rinsing, a nifty milk cleaning prompt and internal counts that keep track of coffee cleaning and descale cycles. Double Drinks - A quick tap of the 2x button lets you grind and brew twice for each drink option. Good Coffee - Hey hot stuff! The Miele in our office tends to pull quite a bit hotter than other superautomatics we've tested. Milk Cleaning - Plug the end of the milk siphon into the drip tray and hit ok! Your Miele will automatically flush through its milk system, no scrubbing or disassembly needed. Profiles - Setting up your own custom profiles is crazy convenient for big households or making a guest feel at-home with their own list of specially-crafted coffee drinks. Deep Footprint - We love the short, fits-under-anything height of the CM6350, but the trade-off comes with extra length. This stretch limo of an espresso machine goes on for nearly 17 inches. What it Covers: SCG's Open Box Equipment.